The Albion Football Club wish to announce the signing of new head trainer Jayde Tunzi and trainers Madeline Odgers and Margaret Beckman. Jayde comes across from Spotswood with lots of experience being Head Trainer for the Under 15's and Under 19's in 2016. Jayde admitted that she was a little nervous coming into a club that had the same Head Trainer for such a long time, but since arriving she has said the Staff, Players and Parents have been really nice! Madeline is currently studying a Bachelor Exercise Science and Sport Practice at Victoria University. Madeline comes across from the RDFNL where she has been a boundary umpire since 2015 and worked as a trainer for the umpires on gameday throughout the 2016 Finals Series, She has also served time in the Australian Air Force Cadets. Lastly Margaret is currently in her 4th year of studying a Bachelor of Health Science and Applied Science, Margaret admitted that she has the skills and knowledge required to become a trainer but she hadnt found the right opportunity until now. Margaret had already completed a Diploma of Health Sciences and also received the Highest Achiever Award. "Everyone is so welcoming and kind, it was clear from the very beginning that the club is a family" Said Margaret . 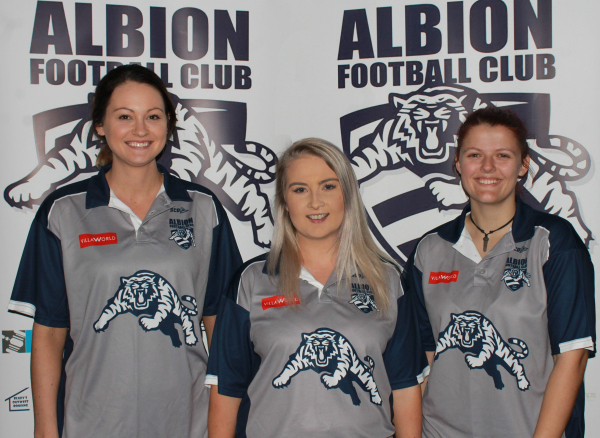 From everyone at the Albion Football Club, we would like to congratulate and welcome aboard these three new girls, and look forward to working with them in 2017!